In what the German kaiser called a “dark day and dark hour,” Europe in 1914 plunged into war. The United States declared itself neutral in what would come to be known as World War I, and in Los Angeles, USC President George Finley Bovard ’84—one of USC’s earliest graduates—cautioned the university’s young men not to abandon their studies to seek excitement, but to be prepared for duty if called upon. “If the time comes, we will all go—I’ll go myself and lead the whole college,” said the 58-year-old Methodist minister. While the U.S. eventually entered the conflict, Bovard’s declaration never came to pass. But when USC began training Army officers in 1914, it laid the underpinnings for a long relationship between the university and the military. Today these ties are more robust than ever. Reserve Officers Training Corps (ROTC) programs at USC prepare future leaders. USC faculty members teach veterans who are pursuing their degrees on campus or online. 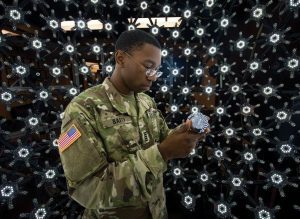 Researchers rigorously study the complex health needs of war veterans and their families, while other scientists and engineers partner with the military to develop technology in virtual reality, telemedicine and beyond. Just last year, the Steven A. Cohen Military Family Clinic at USC opened, giving L.A. County’s more than 325,000 veterans and their families access to free mental health services. Operating in partnership with the USC Suzanne Dworak-Peck School of Social Work and the Department of Psychiatry and Behavioral Sciences at the Keck School of Medicine of USC, the clinic is funded by a $15.7 million grant from the Cohen Veterans Network. In 2016, USC also saw the launch of Army Research Laboratory West, the largest U.S. Army-sponsored university research outpost in the nation. 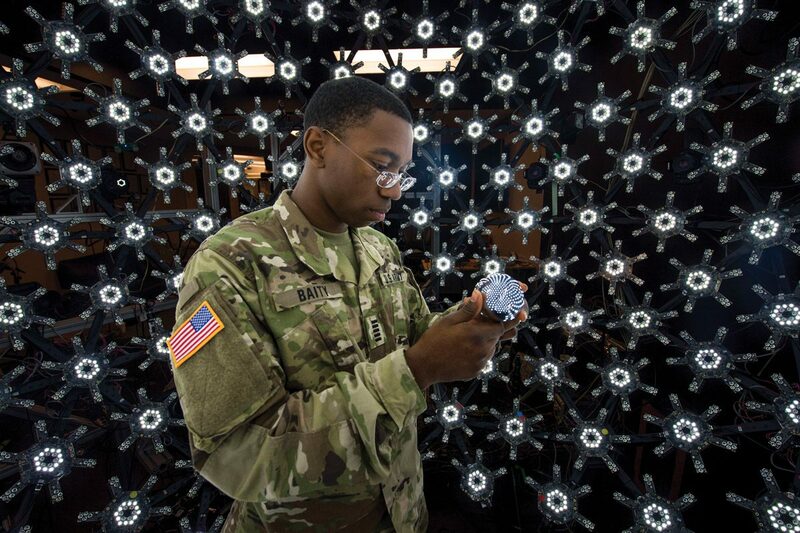 Based at the USC Institute for Creative Technologies in L.A.’s Playa Vista neighborhood, ARL West is pioneering an open campus model for closer collaboration among military, academic and industry experts in science and technology. And when the Military Times released its 2016 picks for the best colleges for veterans, USC was one of only a few private research universities on the list. 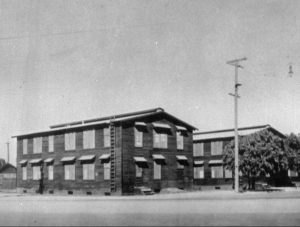 A month after the United States entered the Great War in 1917, USC placed all of its campus resources at the disposal of the federal government. By the following year, 600 students had left for the service, an ROTC program opened on campus, gym classes morphed into training courses, and faculty formed a military company of their own. As the war continued, some 1,000 students pitched tents on Bovard Field, lived under Army regulations and attended classes in uniform. With the return to peace, USC’s ROTC training unit was disbanded. 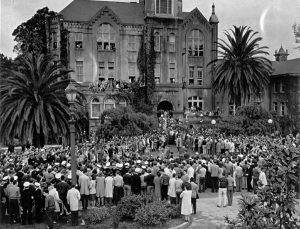 But as World War II dawned, USC served as a naval preparatory flight school and hosted training programs for the Army, Marine Corps and Navy. 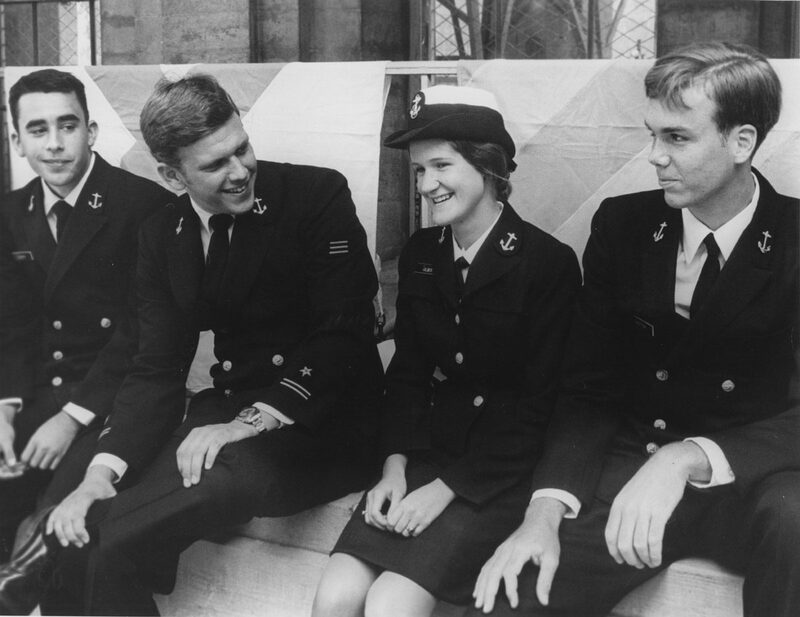 The Naval ROTC program began in 1940, followed by Air Force and Army programs, establishing a relationship that continues today. And USC became a major training center for managers who would run technical operations in the emerging defense industry. World War II saw student enrollment decrease by 15 percent, and 75 faculty members marched off to war, along with more than 2,600 alumni. By 1945, 75 percent of the male student body was in uniform. Female students served in the U.S. 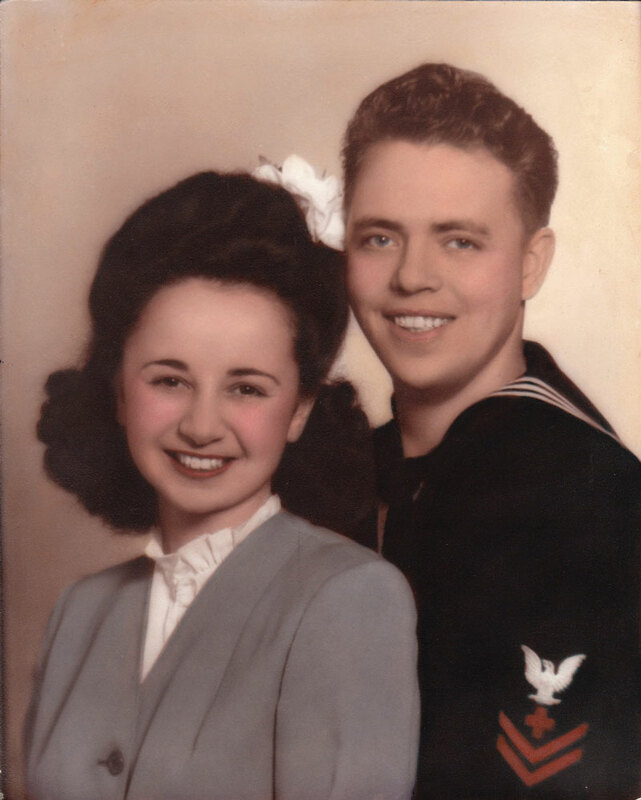 Naval Reserve, donated blood and made other contributions on the home front. After the war, veterans arriving under the G.I. bill swelled USC classrooms. 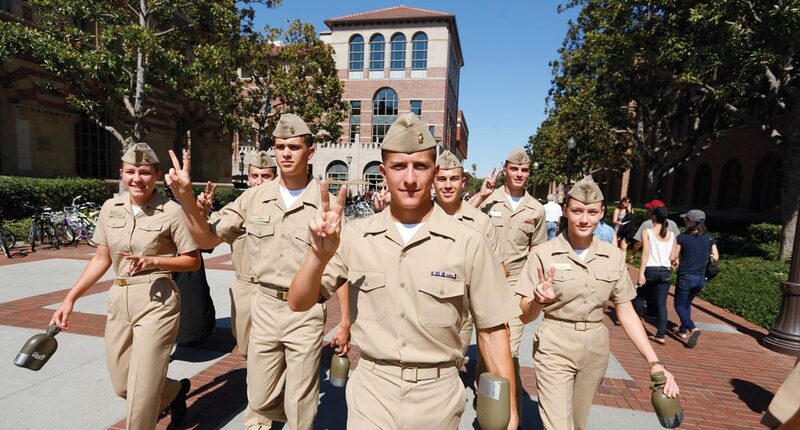 Unlike other institutions, USC put no limit on veteran admissions. 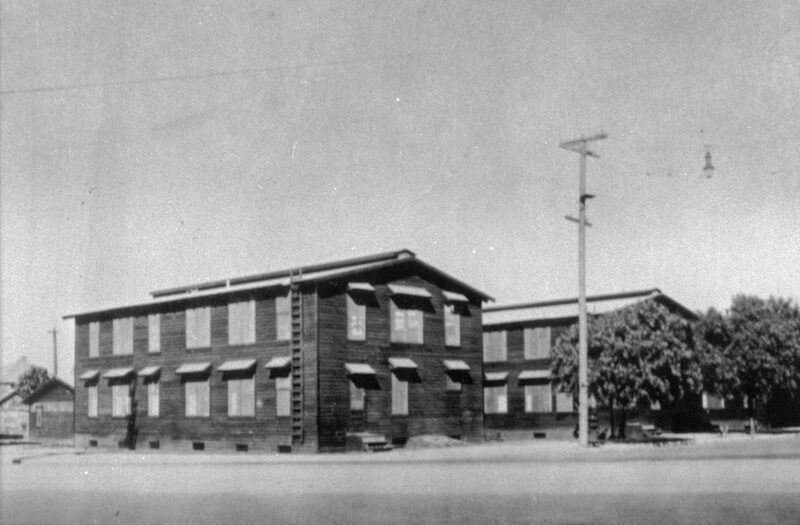 The result: Between 1945 and 1948, enrollment of daytime and evening students doubled from 11,800 to 24,000. 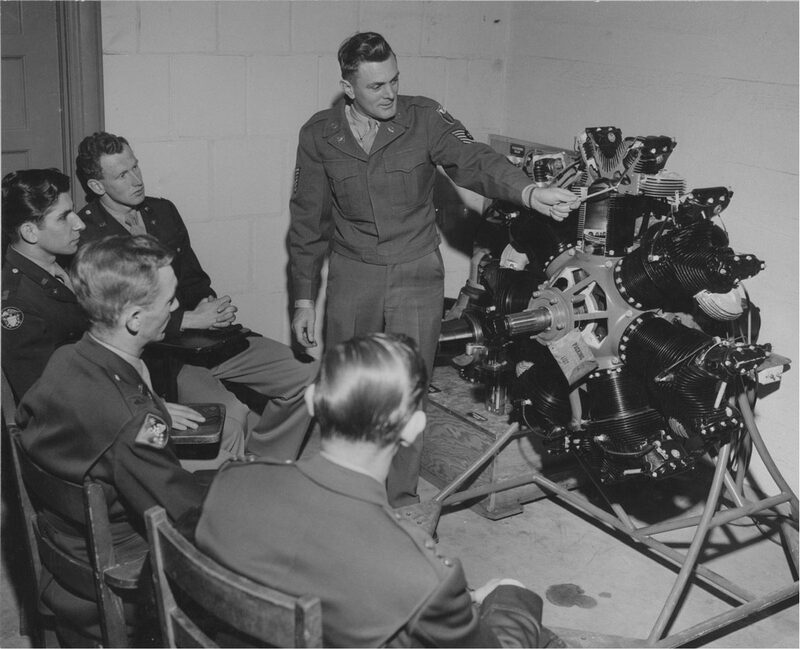 The surge in veterans subsided in the 1950s, and during the Cold War, the university’s links to national defense shifted from manpower to research and technology. USC won a succession of bids for research centers such as the Information Sciences Institute, which supports the U.S. Defense Advanced Research Projects Agency. Today, USC ranks No. 4 among private research universities in Department of Defense-sponsored research expenditures, with more than $200 million in active research funding. The relationship between USC and the military wasn’t always smooth. In the 1970s, the Vietnam War spurred protests at colleges nationwide. At USC, student protestors at least twice tried to take over a building that housed the Air Force ROTC detachment, calling for an end to military training at the university. But ROTC continued. 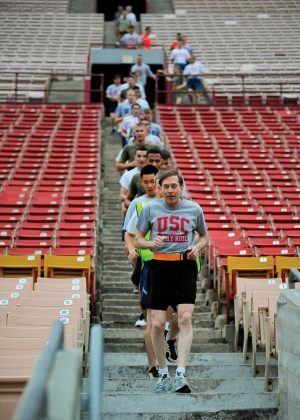 The pace of military and veteran activity at USC kicked into high gear decades later, after the Sept. 11 attacks in 2001. A newly formed U.S. Department of Homeland Security established its first national research center at USC, the Center for Risk and Economic Analysis of Terrorism Events, in 2004. The center brings together policy experts and engineers to study the costs and consequences of terrorism. And, responding to the growing need for mental health workers equipped to counsel combat veterans and their families, the USC Suzanne Dworak-Peck School of Social Work pioneered the military social work concentration in its Master of Social Work program. The first program of its kind in a civilian institution, it has graduated more than 1,500 students since 2008. The school also houses the USC Center for Innovation and Research on Veterans & Military Families, where researchers study the long-term health of service members, veterans and their families—covering issues from post-traumatic stress disorder to sexual assault in the military. New academic programs also have sprung up to meet the educational needs of veterans returning from Iraq and Afghanistan. In 2012, the USC Marshall School of Business rolled out its Master of Business for Veterans degree, enabling veterans to build on the management and leadership experience gained during service. Then there’s the Yellow Ribbon Program, which has helped countless veterans attend USC and other universities. Under the initiative, the university and the U.S. Veterans Affairs Department partner to pay for any tuition that remains after veterans reach their G.I. Bill maximum benefit. USC offers unlimited slots for academically qualified veterans, and it’s one of only nine top private research universities that ensure them full undergraduate tuition funding. USC’s Veterans Appreciation Week includes a career fair for vets, with recruiters from major companies, law enforcement and school districts. USC partners with the Warrior-Scholar Project on a weeklong academic boot camp to prepare veterans for college life. The Los Angeles Veterans Collaborative, housed in the USC Center for Innovation and Research on Veterans & Military Families, is a network of more than 400 organizations that address issues faced by local military members. The goal: make L.A. the most veteran-friendly community in the country. 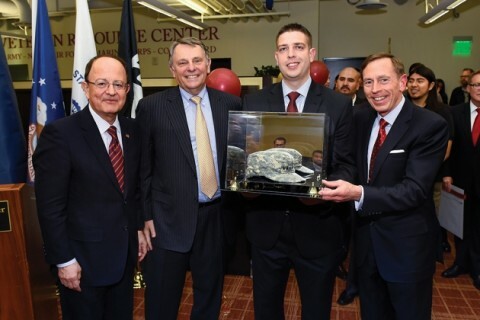 Meanwhile, more than 170 service members studying business and engineering have gotten a boost through the Schoen Family Scholarship Program for Veterans. 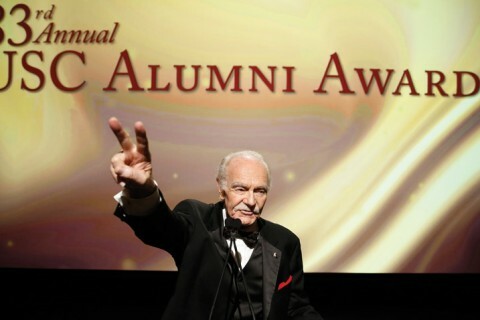 The $16 million endowment fund was established in 1986 by Marine veteran and USC Trustee William J. Schoen ’60, MBA ’63 and his wife, Sharon, to help vets attend USC. USC programs support the families of military members, too, like Audrey Daly. With her family stationed at a base in Germany when she was in high school, Daly had no easy way to tour U.S. colleges. But thanks to the Provost’s Pre-College Summer Scholarship for children of military members, she visited USC. The scholarship covered all expenses associated with her four-week summer stay in 2014, which immersed her in campus life. Today, she’s a USC sophomore majoring in theatre. “It was such a fantastic experience and really helped me shape my goals and my future,” Daly says. 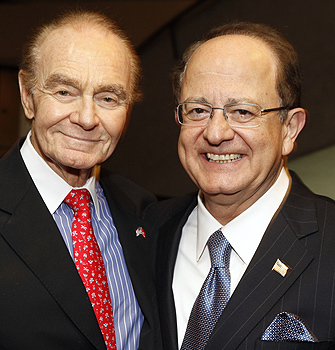 Military ties are woven deeply throughout USC, and Nikias views the relationship with gravity. 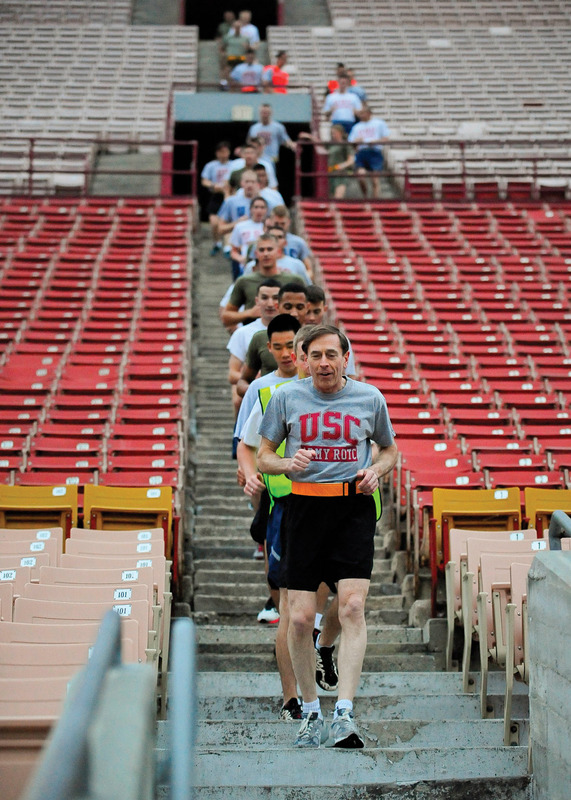 USC has a long legacy with the military. See a few of the highlights in our timeline. I shall never forget that day; it remains as clear in my mind as if it were yesterday. Buses were parked along University Avenue and the men slowly entered them, single file. Seemingly every person on campus—student, professor, secretary, custodian, gardener—stood by and watched in absolute silence. There were no brass bands, no patriotic speeches, no flag waving. These young men entered the buses and left for war with no guarantees to return. After the buses pulled away, no one could move, and only slowly did we, one by one, somberly return to our tasks. World War II changed the entire world, but on a very personal level it changed the lives of everyone who stood there in the sunshine at USC bidding silent farewell. 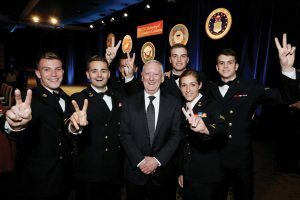 USC trustee William J. Schoen ’60, MBA ’63 and his wife, Sharon, have made a $10 million gift to the university in support of military veteran scholarships.